Hello friends! Tonight for "Wednesday Reviews" and I going to tell you all about my new book, "Happiness is Seeing the Beatles: Beatlemania in St. Louis." No...I am not reviewing my book, (that would be strange), but I did want to give you, the visitors of the blog the inside scoop. A short background first. When I was in the 4th grade, I decided that when I grew up I was going to be an author. When I was 17 I went to my first Beatlefest and went to a discussion where a Beatles author was talking about his book. I remember looking at him and thinking, "I know as much about the Beatle as that guy. I should write a book." And so every year after Beatlefest, I would start to write a Beatles book but would fizzle out until the next Fest. In 2014, after the big 50th anniversary celebrations, I decided that I was going to make my dream come true and write a Beatles book about the Beatles concert in St. Louis. And I am proud that I have accomplished that dream. I am not a writer (which one predominant figure in Beatles fandom has pointed out), but I am a fan. I had so much fun researching and interviewing people for this book. I hope those that read it enjoy it. In this chapter you read all about when George Harrison came to Benton, Illinois in 1963. The interview he gave, the guitar he bought, the performances he did with the 4 Vests, and what he did for fun. It also has information about saving the house that Louise lived in and how Louise helped promote the Beatles in 1963. This chapter covers 1964-1965. There is a lot of information about the top 40 radio station in St. Louis, KXOK 630am and the DJ, Johnny Rabbitt. You will read about fans watching the Beatles on Ed Sullivan, The close circuit concert, A Hard Day's Night and Help! There is also information about the St. Louis Beatles fan club from the 1960's. There are a lot of great stories from fans and what they experienced. This chapter is about the 1964 North American Tour. You will read about the St. Louis fans that went to the concert in Kansas City and their memories of the press conference and the concert itself. Then you will read about the Beatles time on Reed Pigman's ranch. Chapter 4 covers the 1965 tour stop in Chicago. This chapter details the winners of the Johnny Rabbitt contest that traveled up to Chicago to see the Beatles live. You also will hear the stories of some fans that got into the Chicago press conference. Great fan stories in this chapter! John's Jesus state and how the St. Louis teenagers reacted to it kick off this chapter. Read here about the Beatles burning that took place in St. Louis. This chapter features information about all of the opening acts for the '66 North American tour and a brief overview of the tour. There is detailed information about the instruments and gear used on the tour. The chapter ends with fans and insiders accounts of what happened in Cincinnati the day before the Beatles came to St. Louis. The big chapter! This one kicks off with information about Busch Stadium and then goes into all about who brought the Beatles to town and ticket sales. It details the arrival with a great story from a fan that watched the Beatles land at the St. Louis airport and more stories from fans that watched the arrival into the stadium. Insiders gave me details about what went on backstage at the Busch Stadium. Then you will read about the clothing the Beatles wore that rainy night in 1966. There was a local band that opened up the show followed by a lot of rain. Read about how the fans reacted to the rain and how the Beatles got moved up to the middle of the show. Great details about the concert itself can be found in this chapter as well as how the guys left the stadium that night. Changes to St. Louis radio begin this chapter and onto how St. Louis radio was part of the "Paul is Dead" conspiracy. Moving onto when John Lennon met St. Louis legend on the Mike Douglas show and John and Yoko's brief stopover in St. Louis in 1972. Paul McCartney was interviewed on St. Louis radio in 1974. And the chapter ends with details from fans about the George Harrison concert on the Dark Horse tour that came to the Arena. 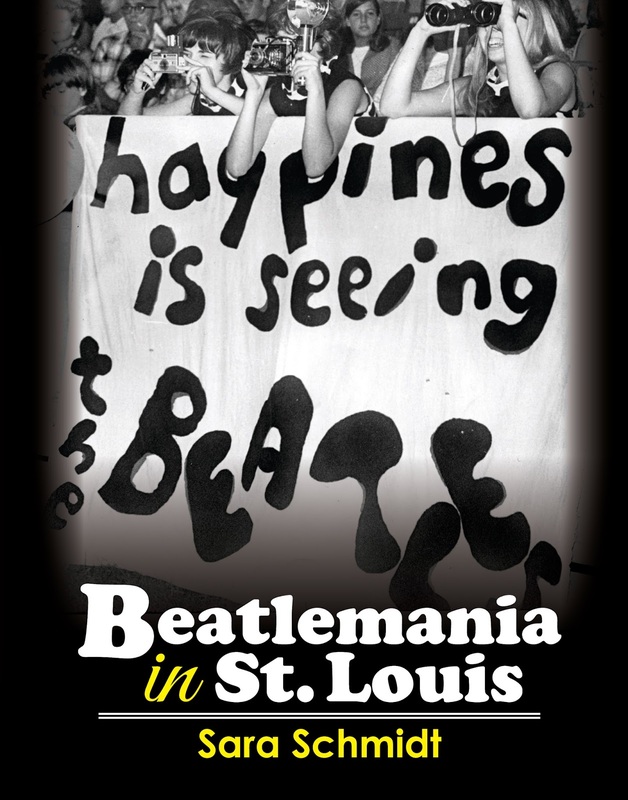 This chapter focuses on Beatlemania in the 1990's. All three of Ringo's concert stops from that decade (1992, 1995 and 1997) and highlighted as is Paul's concert at Busch Stadium in 1993. The St. Louis Beatles fan club is discussed and the Anthology. Paul and Linda came back to St. Louis in 1994 to promote Linda's frozen veggie meals. This of course focuses on 2000-today. Paul's concert in 2002 and 2012 are remembered and Ringo's concerts in 2001 and 2014. Find out why Ringo didn't come back to St. Louis for 13 years! Here I am at the St. Louis Indie Book Fair! 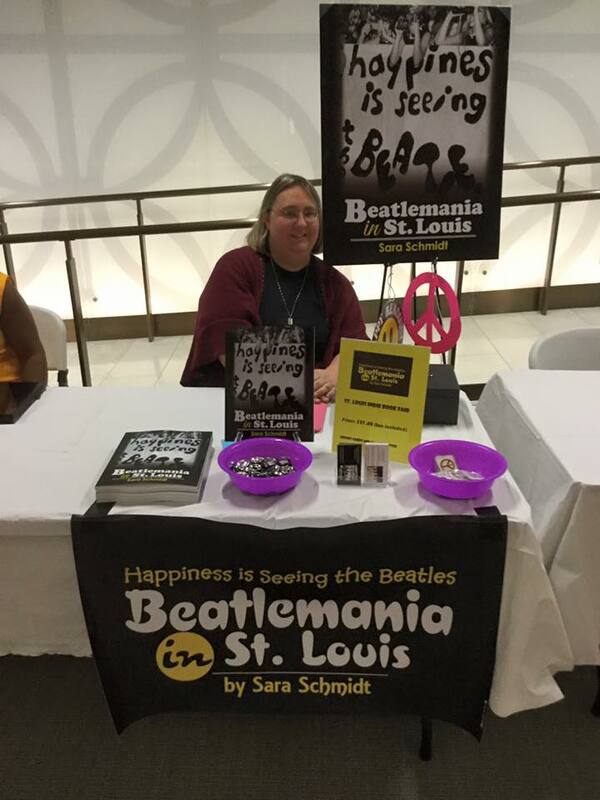 If you would like to purchase a copy of "Happiness is Seeing the Beatles: Beatlemania in St. Louis," They cost $25.00 plus $3.25 for shipping in the United States. Shipping to Canada is $10.00 and everywhere else is $20.00. If you would like to purchase an autographed copy of the book, you can send your payment through paypal to me at beatlesbusch66@gmail.com . Or email me (using the same address) and I can send you my address to send a money order. If you do not want an autographed book, you can purchase it from Amazon. Thanks to each and every one of your for your support this past year as I have been working on the book. Oh my gosh, Sara, it's been so long!!!! And your book is done!!! I'm so excited!!!! I will be procuring a copy asap!!!! Now if you'll excuse me, I have SO much to catch up on, here at MTBFR, over a month's worth, can't WAIT to see what gems await me!! !